This is another useful video tutorial for civil and electrical engineering students. The video focuses on understanding the electrical plain in detail. 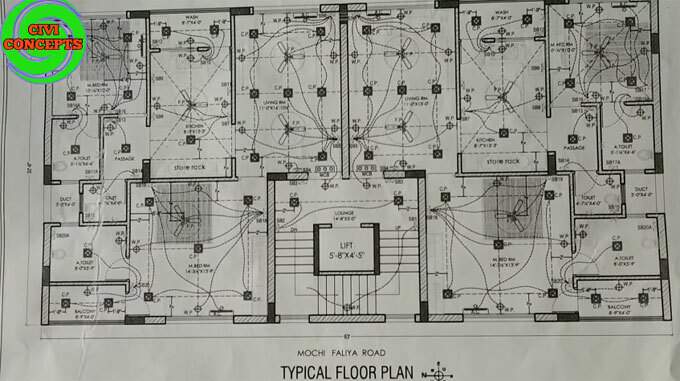 This electrical plan should be prepared prior to start of the actual construction. While constructing the building, all the points provided in the plan should be inserted in the slabs, all the underground wiring should be completed before casting. From the plan, it should be determined the exact locations of all the points so that the electricity can run properly. From this plan, it will be possible to determine the total numbers of points and the probable expenses for installing them. In the plan, you will also get different types of electrical symbols for different items like bell switch, wall point, fan point, switch board, 5 amp ceiling point, MCB etc. Besides, there are detail schedule for electrification in the plan. To get more detail information, watch the following video tutorial.